What Manor of Murder? is a classic murder mystery for younger readers. Its author, Christopher William Hill, clearly knows this genre inside out, and packs the story with countless classic crime tropes. Spooky old mansions, gruesome murders, suspicious-looking servants and enigmatic inspectors, give the book the feel of a good old Agatha Cristie romp, but the characters' youth and a raft of spiffing good jokes make it perfect for a young audience. Eustace and Horacio are returning from boarding school to Bleakley Manor to spend Michaelmas with their ludicrously wealthy relatives, all of whom are brilliantly quirky and unique. There is a curmudgeonly old aunt who pens famous crime novels, an uncle with a pickling obsession, an Egyptologist, a reckless bounder and some enjoyably stereotypical servants, including the larger-than-life cook and the humourless butler. When members of this vibrant cast begin being murdered, there is panic that the frightening legend of Old Bramble Head might be true. 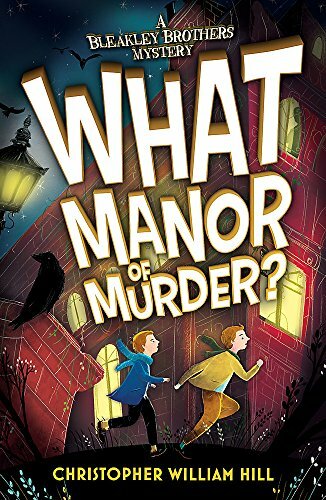 As the witless inspector struggles to solve 'whodunnit', it’s up to Eustace and Horatio (who have a useful preoccupation for detective work) and two other young guests (who have similarly useful interests in murder mysteries and Egyptology) to find the real culprit. William Hill twists and turns his plot to help maintain the mystery and increase the tension. The only bridge to the manor goes down in a storm, and almost everyone has a motive to kill almost everyone else! In the end, readers are treated to a classic gathering in the drawing room to reveal the murderer, with plentiful twists to unravel. What Manor of Murder? sustains a thoroughly endearing old-fashioned tone throughout, lampooning the frightfully rich, posh upper classes and making use of classic vocabulary like 'ripping' and 'right and proper'. Though certain coincidences seem a little too convenient at times (how handy that the victim's last will and testament was recently altered! ), this is easily forgivable amongst all the exciting mayhem, mischief and murders!